Like stories with a little zing? How about an immortal lover? 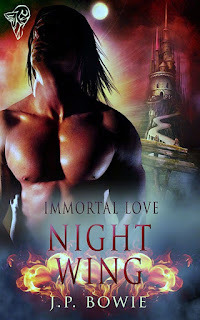 Then you might be in the mood for one of the four Immortal Love stories from Total-E-Bound. Today I'm featuring my friend, JP Bowie's story, Night Wing. 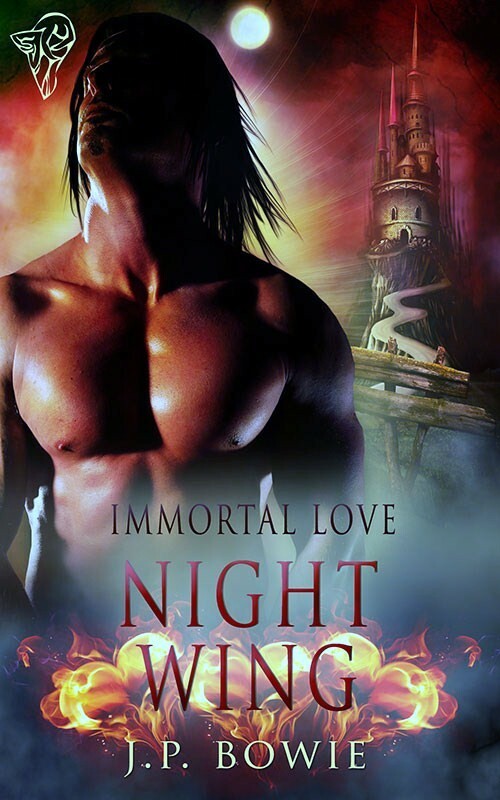 Want to know more about the Immortals Collection? Click here, then keep reading! Rob Greeley, on the run from a cruel Master, is rescued by a stranger—but when the stranger reveals his true self, is the danger really over for Rob? Rob Greeley is on the run from the 'House of Pleasure' where he was being forced to submit to pain and humiliation by Rafe Gunderson, the owner of the London hideaway for those who wish to act out their Dom/sub fantasies. Trapped in a blind alley, Rob is about to give up hope until a mysterious mist arises and leads him into the arms of Gareth Falconer, a vampire, who promises Rob that no one will ever harm him or try to take him against his will, again. The love they find in each other’s arms is threatened when Gareth’s ex lover and nemesis, Jacob Marsden, a man who has vowed to never allow Gareth happiness, kidnaps Rob and takes him back to the 'House of Pleasure'. Gareth calls on his maker, Gabriel Torrance, for help, and together they set out to not only rescue Rob, but also eliminate Jacob’s threats, forever. The alley loomed in front of him, dark, eerie, seemingly endless. He could only hope that eventually it would lead to another exit, as yet unseen. He teetered on the balls of his feet, unsure of his next step. Should he venture into the long dark passageway, or just keep on going to the corner? Perhaps, if he chose the latter, they would think he’d taken the alley. Perhaps they would explore that first rather than go farther down the street—or perhaps they would split up, covering both points of his attempt to escape. Whichever way he chose, they would catch up with him sooner or later. It was just a matter of time. He could save everyone a lot of trouble and just wait here for them. Then they would take him back to the Master and he would be punished. His blood ran cold at the thought of what that meant. The cruelty in the Master’s eyes, the vicious leer, the wicked smile that would precede the punishment. No, he wouldn’t give in so easily—this time. His mind made up, he sprinted down the alley between the tall faceless buildings that towered over him on either side. The sudden sound of a cat’s mournful cry startled him, the ghoulish noise echoing through the still night air. Another sound and he turned his head. Oh God, they were there at the entrance to the alley. They had seen him without a doubt. He drove himself harder, although the pain in his thighs from the last beating made him so aware of his weakness, of the futility of his flight. But, damn it, he would not make it easy for them. He chanced another look over his shoulder, and now all he saw was a swirling, silvery grey mist. There was no mist ahead of him. Oh, Jesus, was it just a matter of time before it closed in on him? Would he be floundering around in a moment, unable to see where he was going? Perhaps blundering into the very men who were fast closing in on him—his supposed friends. Panic gripped him as he listened to the pounding of their footsteps, the sounds of their voices, now raised in confusion. He didn’t dare slow down, but kept on running. If the mist was making them hesitate, all the better, surely. Their voices seemed a long way off now, dwindling in volume until all he heard was his own harsh breathing and the rapid thud of his heart. He slowed, then stopped, listening. He turned and stared into the mist that, to his amazement, had stopped swirling a mere few feet away from him. The deep voice coming from behind him made him all but leap out of his skin. He whirled round to face this new threat, his fists raised defensively. "You are safe. The men who pursued you have gone—and I mean you no harm." The man who stood in front of him was tall, slim, broad-shouldered and, in the half-light cast by a lamp high above them, Rob could make out long, light-coloured hair that hung around his shoulders. "Gareth Falconer. And you are?" "Oh, um… My name is Robin Greeley. My friends used to call me Rob." "They don’t call you Rob anymore?" "I don’t have friends anymore," Rob said, not attempting to hide the bitterness. He glanced behind him again. "The mist—it’s gone." "Yes, along with the men who were pursuing you." "Not tonight. They are a great distance from here at the moment." "What?" No further explanation seemed to be forthcoming. "Well, I must thank you for your help, Mr…um…Falconer…?" "Gareth. But I really should not stop—they might find their way back here. They know where I am and—"
"I told you, you are safe, Rob. There is nothing they can do to harm you again tonight."